Nationality: Danish. Born: Copenhagen, 9 November 1948. Education: Studied advertising photography; earned diploma as a director of photography from Danish Film School, 1971. Family: Married Pernilla Ostergren, star of Den Goda Viljan , 1991. 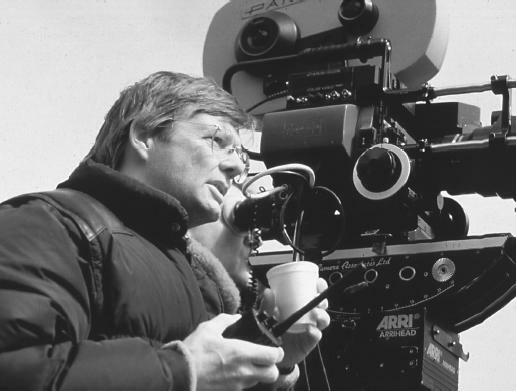 Career: Selected by filmmaker Jorn Donner as cinematographer on Homeward in the Night , 1976; directed his first feature, Honningmane , 1978; also directed dramas for Danish television, as well as episode of The Young Indiana Jones Chronicles for American television. Awards: Outstanding Film of the Year, London Festival, for Zappa , 1983; Special Jury Prize, Young Peoples' Cinema Festival at Lyon, and Best Danish Film Award, for Tro, hab og kaerlighed , 1984; Culture Award, Danish Trades Union Congress, 1984; Oscar, Best Foreign Film, and Palme d'or, Cannes Festival, for Pelle erobreren , 1987; Palme d'or, Cannes Festival, for Den goda viljan , 1992. Agent: Tom Chasin, The Chasin-Becsey Agency, 190 N. Canon Drive., Suite 201, Beverly Hills, CA 90210–5319, U.S.A.
Honningmane ( Honeymoon in My Life ) (+ sc); Kim G.
Interview in Cinema (Paris), April/May 1986. Interview with Y. Alion, in La Revue du Cinema (Paris), November 1988. Interview in Positif (Paris), November 1988. "Film: Bille's Feast," an interview with J. Jensen, in Village Voice (New York), 7 June 1988. "Cold Comfort," an interview with Colette Maude, in Time Out (London), 1 July 1992. "August Harvest," an interview with R. Neff, in Film Journal , March 1997. Brovik, I., article in Chaplin (Stockholm), vol. 30, 1988. Flamm, Matthew, article in New York Post , 30 December 1988. Lohr, Steve, "For Bergman, a New Twist on an Old Love," in New York Times , 6 September 1989. Bjorkman, Stig, article in Chaplin (Stockholm), vol. 33, 1991/1992. Maslin, Janet, "Swedish Film Takes Top Honor at Cannes," in New York Times , 19 May 1992. Alderman, Bruce, "Intentions Bests Cannes Field," in Variety (New York), 25 May 1992. Gritten, David, article in Los Angeles Times , 12 July 1992. Jones, Andy, article in Newsday (Melville, New York), 16 July 1992. Camhi, Leslie, "He Said, She Said," in Village Voice (New York), 28 July 1992. Moerk, Christian, "Reluctant August Shuns Hollywood," in Variety (New York), 3 August 1992. Cowie, Peter, "Directors of the Year," International Film Guide (London, Hollywood), 1994. Landrot, Marine, "Une jeunesse d'enfer," in Télérama (Paris), 2 August 1995. Since the retirement of Ingmar Bergman from film directing in the mid-1980s, Bille August has become Scandinavia's premiere international filmmaker. August's debut feature, In My Life , the story of a seemingly bright and optimistic middle-class Copenhagen couple and how their hopes steadily disintegrate, heralded the appearance of an important young talent. His follow-up features, Zappa and Twist and Shout , are keenly observed tales of teen angst in the 1960s. For international audiences, they served as reminders that adolescent dilemmas and concerns cut across cultures and language barriers. August's next project was The World of Buster , an amusing made-for-TV kiddie film which ultimately is a minor credit on his filmography. In Zappa and Twist and Shout , August examines the distinction between characters from separate social classes. This also is the case in the feature he made after The World of Buster. This work, the career-defining Pelle the Conqueror , is a wonderful, universal film about desire and disappointment, dignity and dreams. Along with Gabriel Axel's Babette's Feast , it was the first Scandinavian film since the heyday of Bergman to earn a high international profile. Set at the turn of the twentieth century, it is the story of Lasse (Max von Sydow), a humble old widower who has emigrated with his son Pelle from poverty-stricken Sweden to the relative prosperity of Denmark. Lasse and Pelle are in search of a better life. Instead, they find themselves practically indentured servants on the aptly named Stone Farm, a harsh and dreary estate owned by a penny-pinching philanderer and his frustrated, faded beauty of a wife. Pelle the Conqueror is a subtle film, the kind in which the characters' quick glances reveal volumes about what they are thinking and feeling but never, ever could articulate. Its multi-faceted narrative presents a landscape of villains and victims, a world in which any hint of true love is stifled, and an environment in which the well-heeled but repressed upper classes use and abuse their power by brutalizing the lower classes. As the seasons turn and the plot unfolds, Pelle begins to transcend the mysteries and fears of childhood. It becomes clear to the boy that if he is ever to get beyond the stifling existence of Stone Farm, he will have to part with his loving, well-meaning, but weak father and set forth into the world. Indeed, the force that holds the film together is the relationship between Pelle and Lasse. There is a poignant, life-sustaining bond between the boy, whose experiences here clearly will shape the course of his future, and his father. August never overplays the story's melodramatics. His direction is sure-handed as he weaves the tale, allowing the viewer to come to know Lasse, Pelle, and the other characters. As much as anything else, Pelle the Conqueror is a film about physical presences, such as the great ship that brings Lasse and Pelle to their new land, the rural landscape of Stone Farm, and the everyday details of farm labor. The images, stunningly captured by cinematographer Jorgen Persson, are as beautiful as they are loaded with drama and emotion. Unlike dozens of filmmakers from across the world who have impressed with films not nearly as striking as Pelle the Conqueror , August has refused to go Hollywood. Instead, he has staunchly criticized films whose prime aesthetic motivations are car crashes and special effects, and has chosen to remain in his homeland and direct films which are motivated more by character and plot development. Upon the success of Pelle the Conqueror , August was the logical choice to be selected by Bergman to direct the latter's autobiographical script, The Best Intentions , a follow-up to Fanny and Alexander. The Best Intentions is the story of the courtship and marriage of Bergman's parents; the end result is a film of which the master could be proud. The third film in the trilogy, Sunday's Children , was directed by Bergman's son, Daniel. After Pelle the Conqueror , August had attempted to film The House of the Spirits , based on Isabel Allende's best-selling novel, but could not obtain adequate funding. He eventually got the film made on an estimated $27-million budget. The film was his first major foray into international filmmaking, but it also proved to be his first major failure. The House of the Spirits charts forty-five momentous years in the lives of the South American Trueba family. August directed a notable cast that included Meryl Streep, Jeremy Irons, Glenn Close, Winona Ryder, Vanessa Redgrave, Armin Mueller-Stahl, and Antonio Banderas. Unfortunately, the result was wholly unsuccessful, with many of the actors miscast and seeming out of place in the setting.